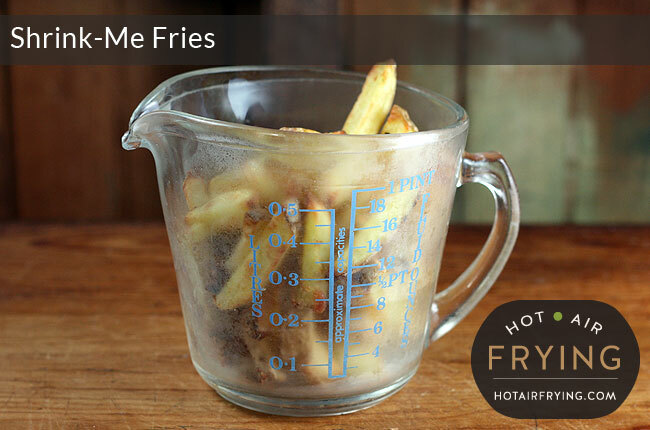 You are here: Home / Recipes / Breakfast / Shrink-Me Fries — Really? 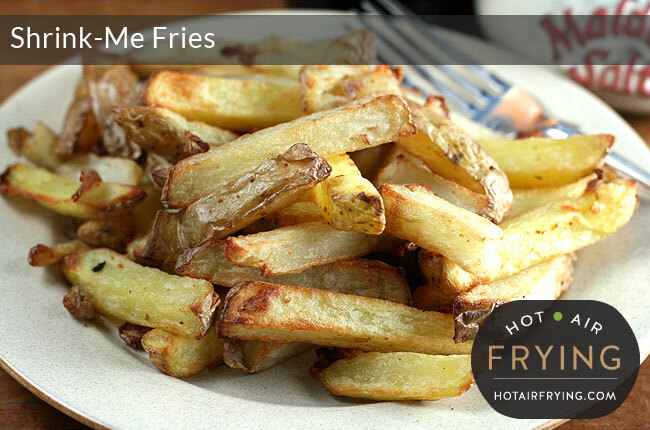 This is how you make 2 cups ( 175 g / 6 oz) of crispy, succulent French Fries / chips for just 6 Weight Watcher PointsPlus™ / 230 calories. For real? You bet your sweet bippy. And these are going to be some of the best fries / chips you’ve had in a long time. These are so low in “fattening” power while being high on the “fill you up” scale, that I often have these as part of breakfast, with an egg and one or two lean breakfast sausages, and slices of fresh tomato. Or as part of a salad plate. I kid you not. As usual, the recipe first, then the discussion after. 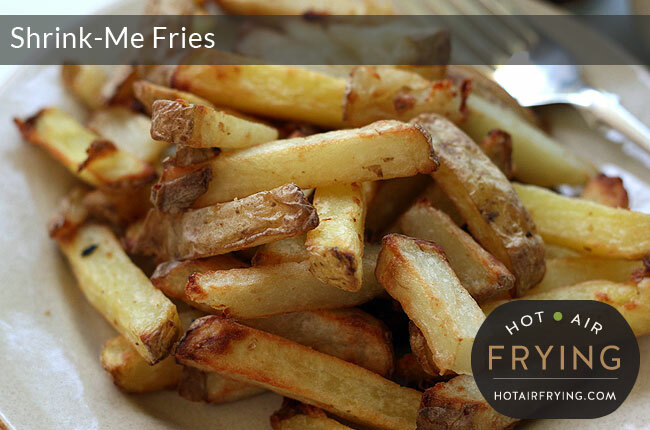 Just the look and smell of these healthy air fries will make your mouth water. They are even healthier if you leave the skin on for more fibre! Wash the potatoes. Peel or not according to your own preferences. Put through a chipper or cut manually into chips. 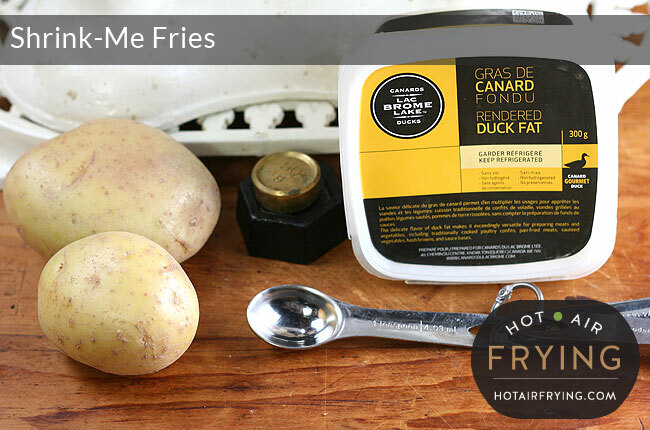 Paddle-type fryer (such as Actifry™): Put the chipped potato into the chip pan, with the 1 teaspoon of duck fat. Cook for 30 minutes. 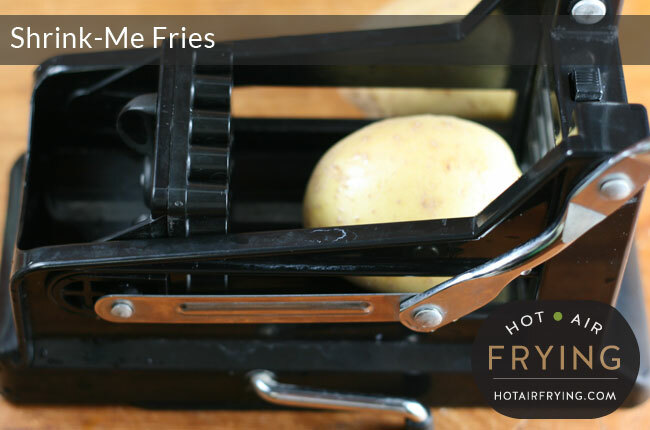 Basket-type fryer (such as Philips AirFryer™): Put the duck fat in a medium-sized microwave-safe bowl, zap it for about 10 to 15 seconds, then toss the cut potato in it till coated. Cook for 20 to 25 minutes, starting at 160 C (320 F). Half-way through, toss, and raise temperature to 180 C (350 F). 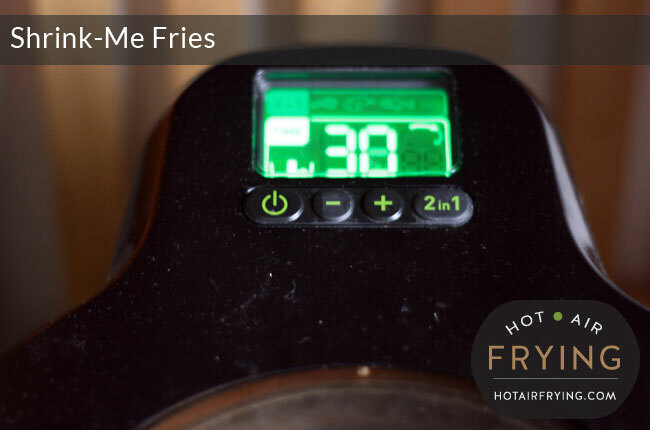 If you double the recipe, allow about 10 minutes extra cooking time in an Actifry. The ingredients are 250 g (9 oz) of raw potato, and a teaspoon of duck fat. That’s 2 potatoes about the size of a small fist. 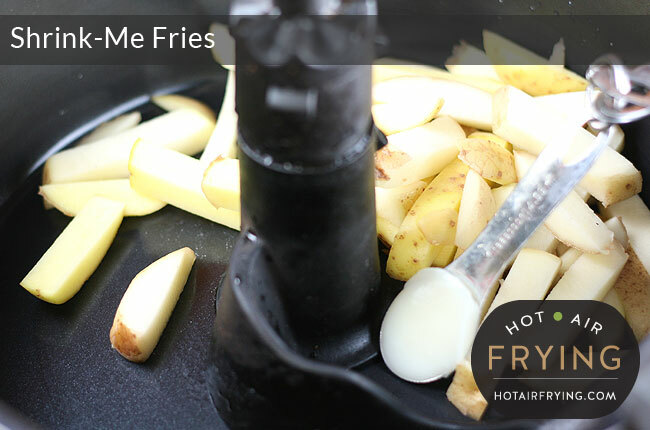 And don’t worry, this will make more fries than it seems at first blush from looking at the potatoes. You will end up with quite a generous portion, I guarantee. 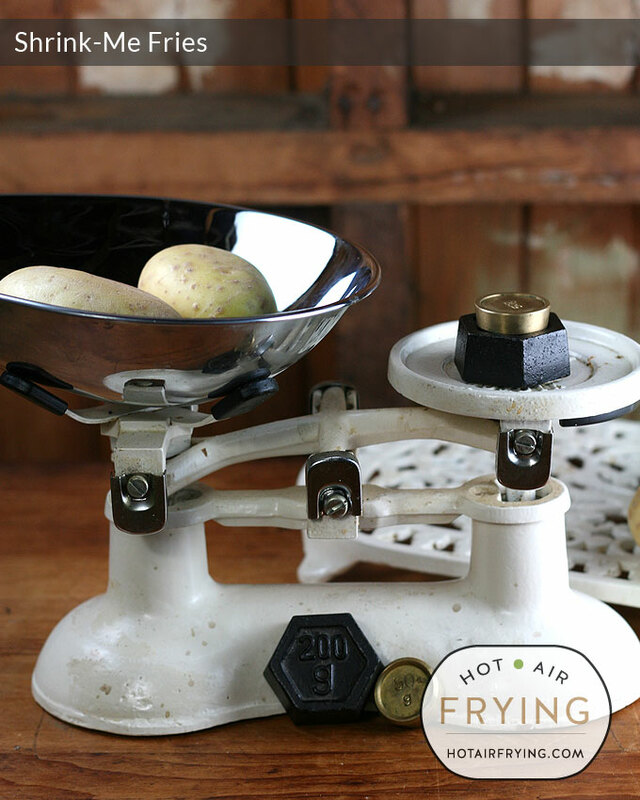 If you have scales, weigh out your potatoes. Don’t fret if you’re a tidge over or under on the weight. In fact, after you’ve made this a few times, you’ll just eyeball the potatoes I’m sure. I’ve included a shot with a ruler and an American quarter to give you an idea of scale, and like I said, I costed a bit of leeway into the numbers. I’m “paying” for that peel out of my daily ww points, so danged if I’m throwing it out! The skins on these particular potatoes are in nice condition, so they just need a quick, light scrub, and a rinse. Into the chip pan, with the 1 teaspoon of duck fat. 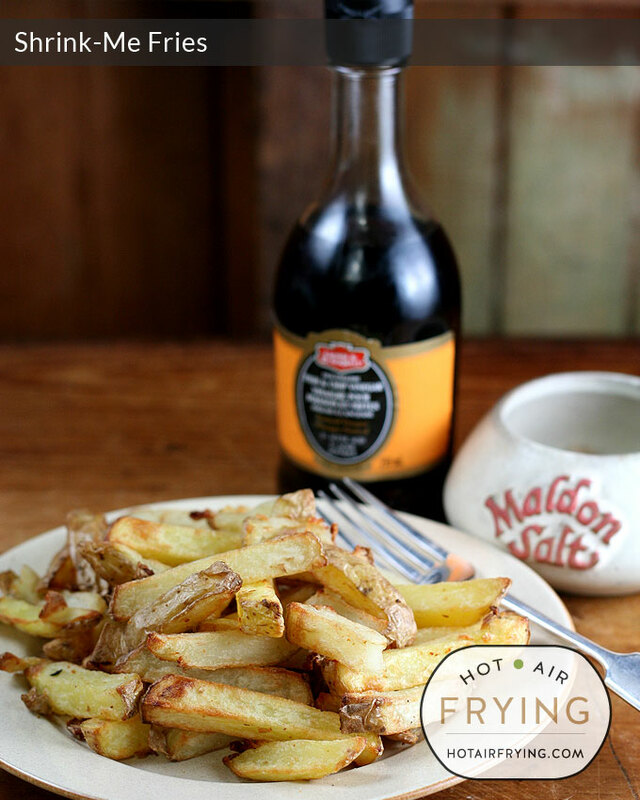 Really, as a cook, you probably honestly won’t want more, because it doesn’t evaporate away during cooking the way that oils do, and while we all want crispy but moist fries, no one wants greasy fries. 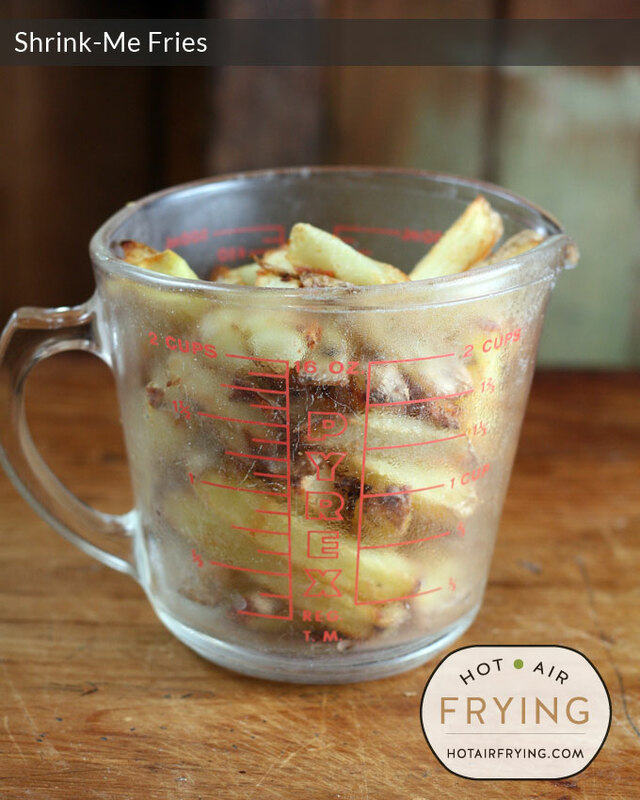 If you are using a basket-type air fryer, put the duck fat in a medium-sized microwave-safe bowl, zap it for about 10 to 15 seconds, then toss the cut potato in it till coated. In an Actifry, I give them 30 minutes to cook. In my basket-type fryer, about 20 to 25 minutes with a shake half-way through, which means I do two timers: one at 15 minutes, then reset for the final 10 minutes. How long exactly you cook them for will depend upon your preferences, and what variety of potato you end up using. You will end up with about 2 cups ( 175 g / 6 oz) . The volume / end weight will vary, again, based on what variety of potato you use. If you don’t think in cups, you can try thinking a “dry pint.” Or half a “dry litre”, not that there is such a thing! Or if you can picture 175 g / 9 oz, more power to you! 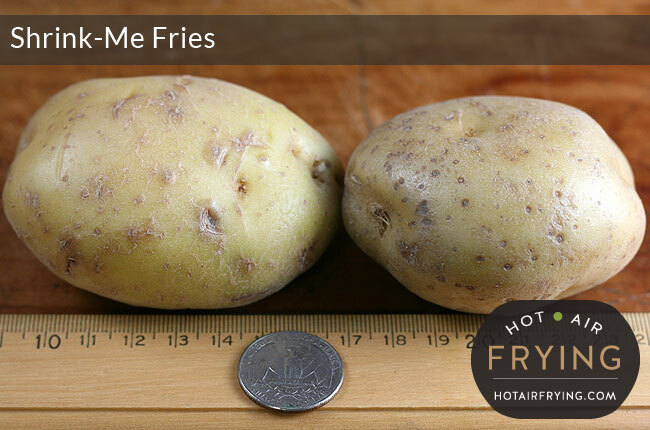 Since fast-food French Fries / Chips have been classed as “Supersize Me” food, and these fries actually make for sensible, healthy diet food, I’m gonna call them — Shrink-Me Fries! Per 2 cup ( 175 g / 6 oz) serving: 231 calories, 6 Weight Watchers PointsPlus®. 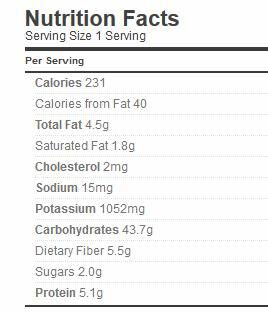 Instead of duck fat using 2 teaspoons of oil: 7 ww points / 270 calories ; using 3 teaspoons of oil: 8 ww points / 313 calories. Here’s how I like to have mine a lot of the time: with salt and vinegar. I like good malt vinegar, such as that by Crosse & Blackwell; and I’m really careful with salt, so when I do have it, I like the good stuff like Maldon Salt. I’m also a ketchup fan, too. Mayo, or Dutch / Belgian Frites Sauce also works for me! What if you don’t want to use the duck fat? Is there any other way to do this one without it? Absolutely. Use another fat of your choice. If you use oil, double the amount called for as oil contains water that will evaporate away.